Ecology is proud to serve the city of San Bernardino through our Fontana Recycling Center with efficient, user-friendly recycling services. Whether you are a local resident or a business owner, Ecology’s Fontana Recycling Center can meet your needs. Bring in recyclables on our approved list for quick and easy recycling. At this center, you’ll find our staff ready to help you through our streamlined process where your recycling will quickly be sorted and then you’ll receive your compensation. 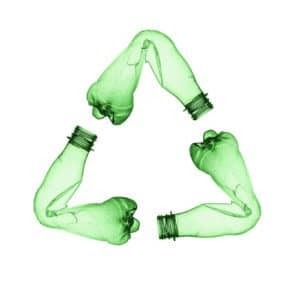 With Ecology, your recycling is easy to handle. We even offer special options for businesses and industries who process large amounts of recyclable items. Find out more about our programs below! 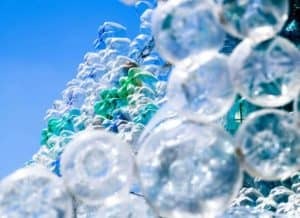 Everything you throw away instead of recycling creates more pollution. When recyclable items are mixed in with the trash, they end up in incinerators or landfills where they pollute the air, water and land. Recycling reduces the need for mining. When new products are made, new inputs come from mining which creates a lot of pollution and disrupts natural habitats. However, when recycled inputs are used, there’s less of a need for mined materials. Using recycled materials can save energy. Manufacturing with recycled items results in lower energy expenditure. Where energy comes from fossil fuels, this can also reduce pollution. Those are enough reasons to send any conscientious person to the recycling center. 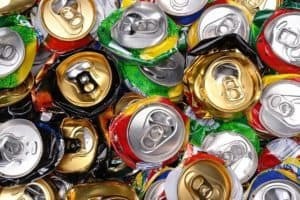 However, to top it off, recycling can also earn you some money! Ecology offers compensation for both scrap metal and CRV. You can call to learn about our current prices for common scrap metals and CRV items. Although not all items are high payers, when you consider that it’s money that would have essentially ended up in the trash, it’s a good deal. And of course, the more CRV and scrap metal you turn in, the higher the compensation. Do you have old pieces of rusty metal lying around? From car parts to appliances, home hardware, industrial scrap and more, there are plenty of sources of scrap metal. Through scrap metal recycling programs, this previously unusable metal can be repurposed and given new life. Scrap metal is made up of two main categories: ferrous and non-ferrous. 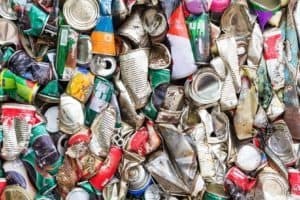 Each of these different types of scrap metals are used in different ways because of the unique elements they contain. The two categories are used for sorting purposes before recycling. The primary defining characteristic of ferrous metals is that they’re magnetic. The main components of ferrous metals are iron and steel. Some of the most common sources of ferrous metals include used vehicles, demolition scrap, old appliances, metal offsets from manufacturing and structural steel. To sort ferrous metal from non-ferrous, a large magnet is often used, attracting all of the ferrous metal to it. Although this type of metal is not as valuable as non-ferrous metals, it’s still worthwhile to recycle it. By recycling ferrous metals, you can contribute to the preservation of San Bernardino’s natural resources. Non-ferrous metals differ from ferrous metals in that they’re not magnetic and don’t contain iron or steel. Instead, these metals are mainly composed of other metals including bronze, aluminum, copper, and nickel, among others. One confusing example of a non-ferrous metal is stainless steel, which is often thought to be ferrous because it has the name “steel” in its name. Non-ferrous metals are common in both industrial settings and in the home. Some common examples of non-ferrous metal sources include household hardware (plumbing), window frames, bicycle frames, wires and car parts. These types of metals are more valuable than ferrous metals. At our Fontana Recycling Center, we’ll receive your ferrous and non-ferrous scrap metals including aluminum, copper, brass, tin, iron and steel. 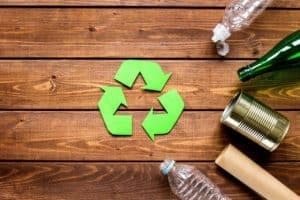 CRV is a recycling program unique to the state of California that works to encourage both citizens and businesses to recycle. In this program, a small price is charged any time you purchase an item with a CRV package such as beer, soda, cans of juice, and more. You can earn this money back by turning in approved CRV items to certified recycling centers, like ours. Here at Ecology, we strive to support all members of the city of San Bernardino in their efforts to recycle. For this reason, we offer a streamlined process that accommodates to the unique needs of both individual citizens and businesses. We offer additional support for industries, businesses and organizations that discard large amounts of scrap and CRV. Our support comes in the form of roll-off bins that we can deliver straight to your property, where you’ll fill them up. When your bins are full, we’ll haul off your load and leave you a new bin. Call our friendly staff to learn more about this program. We are able to accept many recyclable items that fall into the scrap metal and CRV categories. However, at this time our facilities and staff are not able to process the following items. Feel free to give us a call if you’re not sure whether we are able to process your items or if you have questions about our policies. San Bernardino is a large, bustling city and home to many important businesses and culturally important institutions in the Inland Empire. Close to the large metropolis of LA, San Bernardino enjoys proximity to a number of important large cities. Ecology Recycling is committed to offering the conscientious and hard-working residents and businesses of San Bernardino with access to easy, quick and efficient recycling. Our Fontana Recycling Center offers a conveniently located recycling center that provides an easy way to take care of your recycling needs. 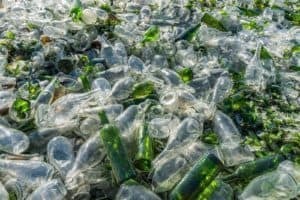 Our goal is to support you in all of your recycling efforts, so feel free to call our friendly staff to discuss how we can help you. Learn more about our recycling programs, current compensation rates and our process by giving us a call today! Welcome to our Fontana CRV and Scrap Metal Recycling location! Monday-Friday 7:00 a.m. to 4:45 p.m. Saturday 7:00 a.m. to 11:45 a.m.